Following the Rabbis for Human Rights’ action alert, calling the JNF not to evict the Sumarin Palestinian family in Silwan, JNF published a response basically claiming: “It’s Not Us! It’s the Settlers!” Meanwhile, the Jewish group Yachad in the UK published a similar call. 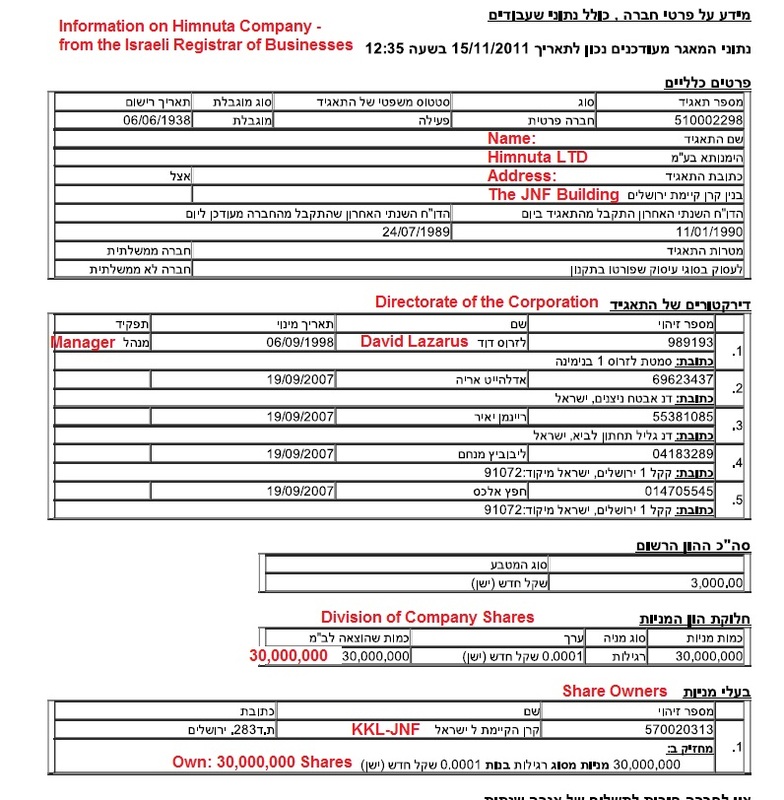 According to JNF’s response, “KKL-JNF leased the land to Elad in the early ‘90’s … KKL-JNF has no rights, control, or responsibility in this issue at all”. In fact, as the Eviction Order proves, all legal action against the Sumarin family has been taken by Himnuta (which is wholly owned by JNF). 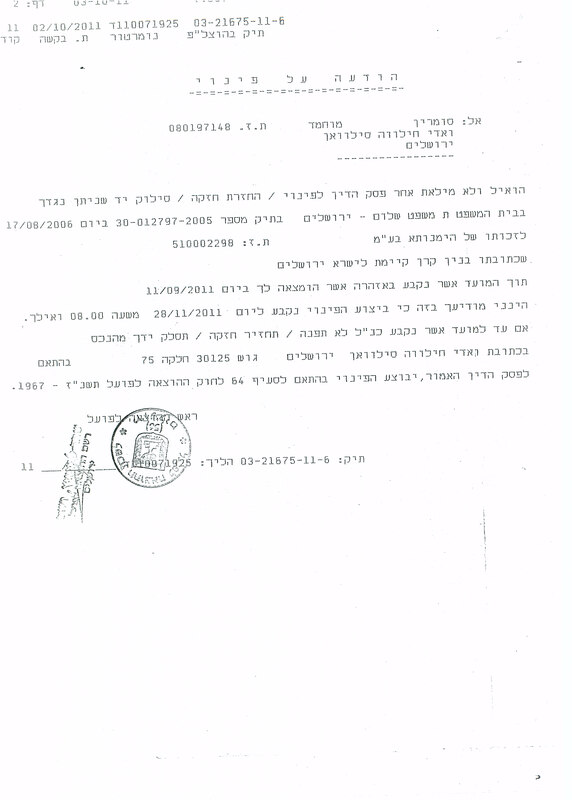 The Elad settlers were never mentioned in any of the lengthy legal proceedings against the Sumarin family. 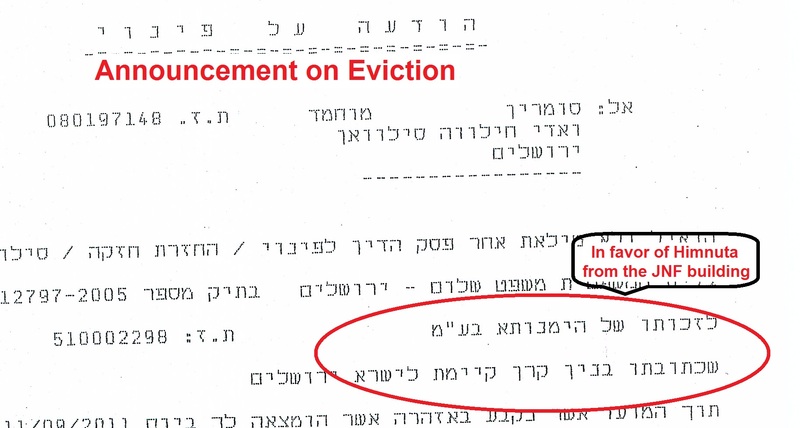 So even if Himnuta did lease the property to Elad in the 90’s, the eviction process is being done in Himnuta’s name. Worse still, if JNF honestly believes that nothing has been done in their name, they have in effect decided to let the settlers use their name and given up all responsibility for the public they represent. What would JNF say about all the other properties they gave to the settlers in Silwan: that they didn’t know? There are other families in Silwan that are still under threat of eviction by Himnuta, fighting in courts against the well-funded lawyers working in JNF’s name. JNF can no longer say “we didn’t know”. JNF must take action and withdraw any legal action to evict Palestinians from their homes. I call on the JNF: Don’t let the settlers use your name against families to create facts on the ground that are morally wrong and could be politically disastrous for Israel. This entry was posted on Friday, November 25th, 2011 at 7:55 am and is filed under Uncategorized. You can follow any responses to this entry through the RSS 2.0 feed. You can leave a response, or trackback from your own site.